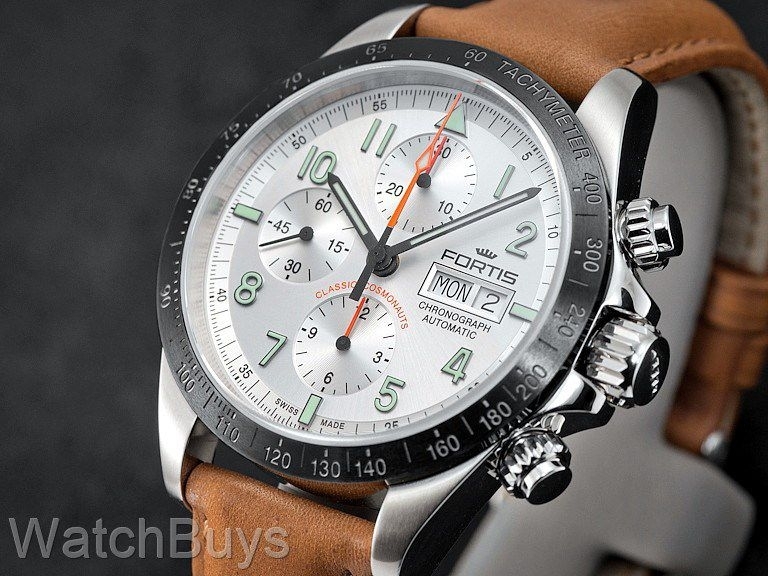 The Fortis Classic Cosmonauts Chronograph Ceramic AM on strap features a 42 mm case with complete chronograph functions. This watch is fitted with a Fortis tan calf leather strap with Fortis signed tang steel buckle. Verified Owner Comments: The dial work is ridiculously crisp. The black ceramic bezel (at this price!) looks great with the AM color way. Running +6/7 seconds a day out of the box. I haven't taken it off since I got it. Plus WatchBuys customer service is second to none. Strap is ok... I don't usually like padded leather but this one is pretty good. Verified Owner Comments: I have spent an entire day staring at this watch. Very handsome sport watch. It fits my 6-3/4 inch wrist well and seems much thinner than the 15MM spec. Can't keep m eyes off of it and it may be a few days before my other wacthes get a turn.